When you’re top of the heap people take notice, and that’s exactly what the Bugatti Veyron EB 16.4 is – top dog in the car world kennel. 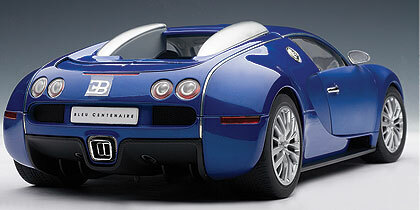 Autoart knows that makes it a prime candidate for a stunning die-cast model. Bugatti is a French exotic car maker that has been turning folks’ heads with its designs since 1909 and now that it’s owned by the German giant, Volkswagen, it has the cash to turn out more world beaters, like the Veyron. Two key facts: Veyron is the most expensive production car in the world at roughly $2.6 million and the fastest in the world at 267.85 mph in Super Sport trim, otherwise it’ll only do 253.52 mph. Slacker! That’s because of its mid-engined 16-cylinder (that’s right 16! 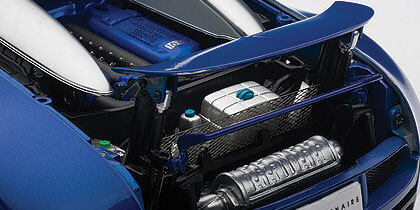 ), 8.0-liter four bi-turbo engine that creates 987 horsepower. The Super Sport makes 1,184 horses, if you were wondering why it’s faster. Bugatti basically puts two V8s together in a W format that features 64 valves and then hooks it up to an all-wheel-drive system via a seven speed computer controlled gearbox. A driver uses paddles behind the wheel to shift in just 150 milliseconds. That’s fast, I don’t care who you are! The numbers are simply staggering with 3 engine radiators, 3 heat exchangers for the turbos’ intercoolers and more. 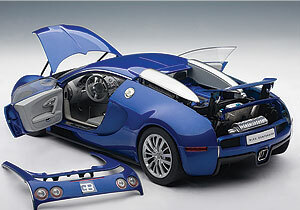 No wonder Autoart took up the challenge to create a 1:18 version of the Veyron in a special two-tone sprintblue matte and sprintblue gloss color scheme designed to mark Bugatti’s 100th anniversary (a few years back!). Performance: What makes this model special? Start with 383 separate parts assembled to near perfection, including a chrome-plated grille, tubular engine air scoops that protrude through the engine cover and peak out above the roof, plus chrome door handles and exhaust pipe ends. Naturally the hood and doors open, but the engine cover is fully removable to expose the highly detailed blue and black engine. The rear spoiler works too, so the model can be posed as if it’s at full speed. Autoart uses photo-etched grilles for all air intakes and outlets, fine work that gives the car a realistic look. Roof trim stripes and outside mirrors are anodized aluminum and the spectacular wheels are chrome-plated and feature red Bugatti brake calipers behind them, resting on black drilled disc brakes. Veyron, named after noted French racer Pierre Veyron, winner of the 1939 24 Hours of LeMans, also features a gorgeous interior. Thanks to a large windshield and sizeable side windows it’s easily viewed without opening the doors. But inside the dash is beautifully detailed with full instrumentation, a realistic shift lever and steering wheel. There are even air vents visible atop the doors for clearing side windows. The “snow-beige” seats look like leather and the Veyron sports real cloth seatbelts with photo-etched buckles. Autoart’s Veyron features beautiful dash detail. 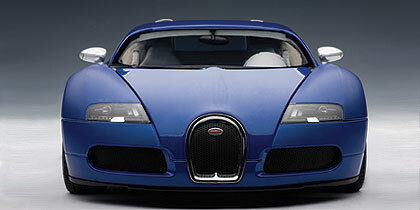 The functional wing on Autoart’s Veyron is an example of the detail on the Bugatti.